The ToughBuilt heavy-duty Roller Stand is ideal when guidance is needed to support & keep long workpieces, like pipes or wood, steady & level. This Roller Stand features box tube frame for strength and stability, a chrome roller allowing materials to glide smoothly on top, legs that fold flat for compact storage, and a height adjustment lever that easily locks and unlocks so the height can be positioned to anywhere from 27.5 inch to 43 inch at full extension. Galvanized steel rollers provide support & smooth movement. The PORTAMATE PM-5093 pedestal roller solves many woodworker's needs for stable support and freedom of movement when working with larger work pieces. With a deluxe pivoting head it features 3 types of work support - an 11.25 inch. polished steel ball bearing roller, a 6-ball multi-directional roller, and a stationary support. Easy to assemble, it will fold Flat for convenient storage. Non-slip rubber feet and a wide footprint ensure stability. Durable powder coat finish and a high strength ABS height adjustment handle with Column wedge Lock feature. With height adjustment from 27 inch. to 43-3/4 inch. (686 mm to 1.1 m) it is ideal for use with Table saws, drill presses and other shop machines. Its heavy duty 200 lbs. (90 kg) load capacity allows you to take on the day. Set of 2 pedestal roller stands. Bosch benchtop tools provide the precision and performance your projects require. Durable quality is not only in every tool, but the trust you have in Bosch benchtop tools. The integrated out feed and supports holds up to 18 ft of material. The universal mounting system allows for use with all major competitors' saws. 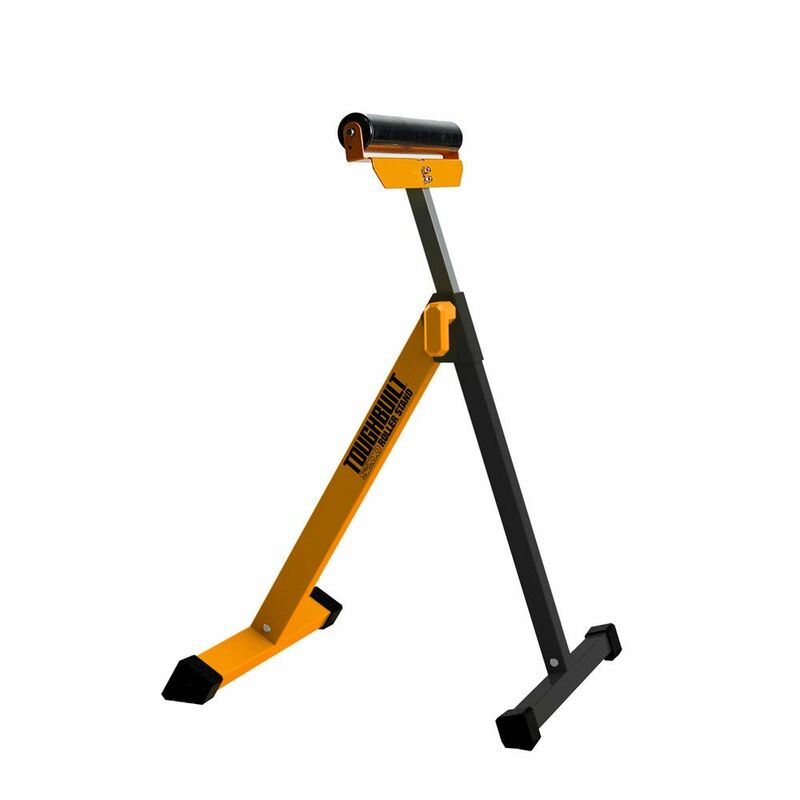 Equipped with an adjustable telescoping levelling leg to provide stability on uneven surfaces. Roller Stand The ToughBuilt heavy-duty Roller Stand is ideal when guidance is needed to support & keep long workpieces, like pipes or wood, steady & level. This Roller Stand features box tube frame for strength and stability, a chrome roller allowing materials to glide smoothly on top, legs that fold flat for compact storage, and a height adjustment lever that easily locks and unlocks so the height can be positioned to anywhere from 27.5 inch to 43 inch at full extension. Roller Stand is rated 4.6 out of 5 by 22. Rated 5 out of 5 by RU55 from Great stability for both sheet and dimensional lumber.... Great stability for both sheet and dimensional lumber. Easy adjustments. Great price and quality construction. Rated 5 out of 5 by JJLLBB from Well built at a great price.... Well built at a great price. Rated 1 out of 5 by ML from This type of stand, which has a fixed-direction roller, allows you to easily ruin your cut. Unle... This type of stand, which has a fixed-direction roller, allows you to easily ruin your cut. Unless perfectly square to the saw your wood will be guided away from the straight, thus ruining your cut. Instead, buy one with roller balls on top. Rated 5 out of 5 by Mtsage from Just what I needed. Good price, well built. Good purchase. Just what I needed. Good price, well built. Good purchase. Rated 5 out of 5 by Win from Excellent quality.... Excellent quality. Rated 5 out of 5 by Jack from Perfect for what I needed.... Perfect for what I needed.